The longan (simplified Chinese: traditional Chinese; pinyin: lóngyǎn; Cantonese long-ngan; literally "dragon eye"; Thai ลำไย) is a tropical tree native to southern China. It is also found in Indonesia and Southeast Asia. It is also called guiyuan in Chinese, lengkeng in Indonesia, mata kucing (literally "cat's eye") in Malaysia, nhãn in Vietnamese (The Species: Euphoria longana Lamk. named "long nhãn" in Vietnamese- literally "dragon's eyes"), Mora in Sinhalese (Sri Lanka) and also "longan" in Tagalog. The tree can grow up to 12 metres in height, and the plant is very sensitive to frost. Longan trees require sandy soil and temperatures that do not typically go below 4.5 degrees Celsius (40 degrees Fahrenheit). Longans and lychees bear fruit at around the same time of the year. To express longan fruit, Vietnamese has a wonder: Da cóc mà bọc bột lọc, bột lọc mà bọc hòn than (literally: Toad's skin covers tapioca wheat, tapioca wheat covers coal ball): toad's skin is the ugly skin, tapioca wheat is the clear white flesh and coal ball is the black seed. The fruit is edible, and is often used in East Asian soups, snacks, desserts, and sweet-and-sour foods, either fresh or dried, sometimes canned with syrup in supermarkets. 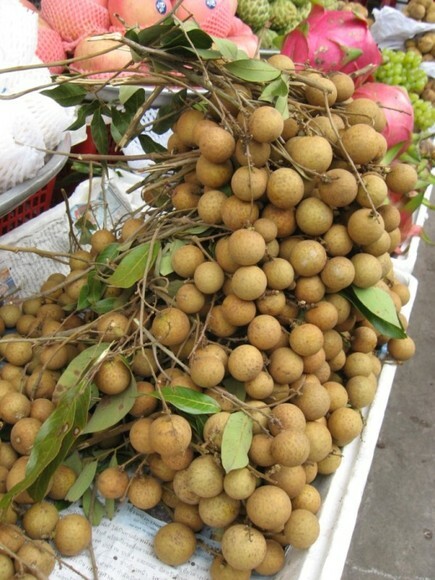 The seeds of fresh longan can be boiled and eaten, with a distinctive nutty flavor. Dried longan (Chinese: pinyin: yuánròu; literally "round meat") are often used in Chinese cuisine and Chinese sweet dessert soups. In Chinese food therapy and herbal medicine, it is believed to have an effect on relaxation. In contrast with the fresh fruit, which is juicy and white, the flesh of dried longans is dark brown to almost black. In Chinese medicine the longan, much like the lychee, is considered a "warm" fruit. Longan trees can produce thousands of ping-pong ball sized fruits that are eaten fresh or dried. Here is some basic information and photos of longan, the "Dragon's eye". Flowers: Pale yellow flowers on upright terminal panicles. Leaves: Alternate leaves with 4 to 10 opposite leaflets. The shape is elliptic or lanceolate and blunt-tipped. Leaves are 10-20 cm long and 3.5-5 cm wide. They are leathery with a glossy-green color on the upper surface and grayish-green on the lower surface. New leave growth has a wine-color. Round fruits with a thin, brown-colored inedible shell. The flesh of the fruit is translucent white, soft, and juicy. It surrounds a big, black seed. That's why it is called "Dragon's Eye." Climate and weather: Longan is a subtropical tree but it grows well in the tropics. It needs a prominent change of seasons for satisfactory flowering. A cool season of 2-3 months results in abundant flowering. Pollination: Mainly by small insects, but also by wind. Type of soil: Prefers rich sandy loam or moderately acid, somewhat organic, sand. Propagation: Mostly grown from seed. Insect pests: The most important pest is the Longan stink bug: Tessaratoma javanica. Other pests include: Erinose mite, scales, fruit flies, aphids, stem borers, leaf eating caterpillars, flower eating caterpillars, mealy bug, fruit spotting bug, elephant beetles and fruit piercing moth. Other pests: Fruit bats or flying foxes. Uses: Fruits are eaten fresh or dried (after peeling skin and removing the seed).